I WAS AT the 2016 COPA Lagos Beach Soccer Tournament held last Sunday, December 11, 2016 at the fast-rising Eko Atlantic City in Victoria Island, Lagos. It is the third straight year that I was attending the event and what struck me the most at this 6th edition was the thick “anti-recession” atmosphere that enveloped the fun-filled arena. Most of the talk in Nigeria during the out-going year has been about the falling price of crude oil, high exchange rate, foreign exchange scarcity, inflation, unemployment, poor electricity power supply and the inability of the Nigeria Football Federation (NFF) to pay salaries and bonuses to national team footballers and coaches. But at COPA Lagos, the only lingua franca is fun, fun and more fun. I am not an ambassador of COPA Lagos, but the organizers have won me over with their creative packaging of the event which gets better and better every year. And then there’s a certain John Abalaka who insists on treating me and my family like royalty and spoiling us a little. Thank you, John. This year’s COPA was reduced to just one day from the traditional three in order to create room for the Confederation of Africa Football (CAF) Beach Soccer Championship which Nigeria is hosting from 13-18 December. The first match of the day was a closely-fought club challenge between Enyimba Beach Soccer team and Coach Kashimawo Laloko’s Pepsi Soccer Academy which the Pepsi boys edged narrowly by six goals to five. If that game was action-packed, the second was fun-filled. Famous music artiste D’Banj led a team of Nigerian musicians and entertainers including Peter Okoye of P-Square to confront Nigerian ex-internationals led by 1997 African Footballer of the year Victor Ikpeba in a celebrity match-up. In Ikpeba’s team also were “Headmaster” Mutiu Adepoju, “Gaddafi” Waidi Akanni, Victor Agali, goalkeeper Alloy Agu and Ifeanyi Udeze. Not surprisingly, the ex-Eagles won the match 2-1 but it was D’Banj that stole the show with his antics which kept the spectators excited. Even before the match got under way, the “Koko Master” was already running a “victory lap” and celebrating like Cristiano Ronaldo of Real Madrid. It was so hilarious. 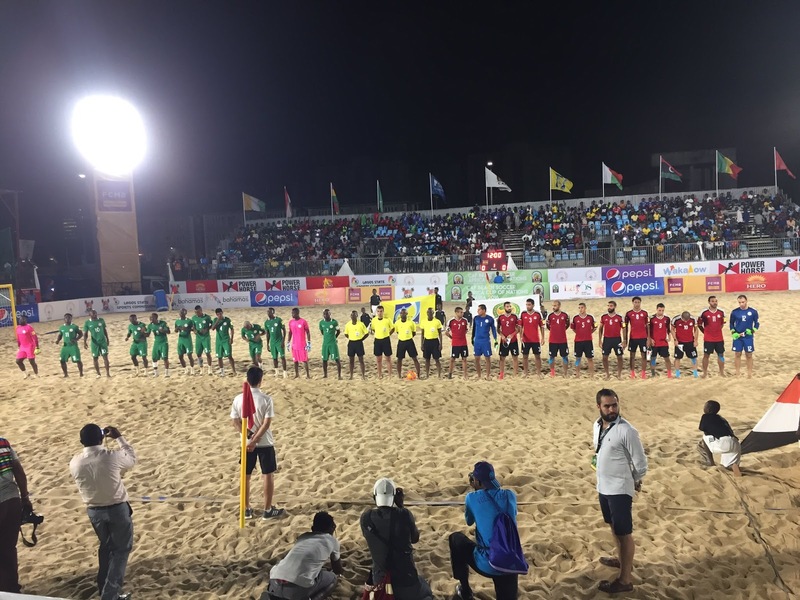 The final match of the day was an international friendly between Super Sand Eagles and European Beach Soccer champions Switzerland. Within the opening two minutes, the Swiss team had already shown their technique and expertise by executing no fewer than five classic over-head kicks. The Eagles fought gallantly to keep pace with them but the gulf in class showed in the end as the Swiss won comprehensively by 8-3. It is the success of COPA Lagos that paved the way for the African Beach Soccer Championship which Nigeria is hosting this year. If you are in Lagos and you missed last Sunday’s colourful teasers, you can make it up by going out to cheer the Super Sand Eagles against Egypt, Cote d’Ivoire and Ghana in their group matches at the African championships. The other group has Madagascar, Libya, Morocco and Senegal and at stake are two qualifying tickets to the Beach Soccer World Cup in Bahamas in 2017. But if you are far away from Lagos and you can’t catch the African championship live, start making plans for the next edition of COPA Lagos in December 2017. At the COPA, there’s no room to think about inflation, economic recession or the price of crude oil. At the COPA, it is great fun all the way. I can testify to that. LAGOS is pulling out all the stops to host the 2016 CAF Africa Cup of Nations Beach Soccer Championship. 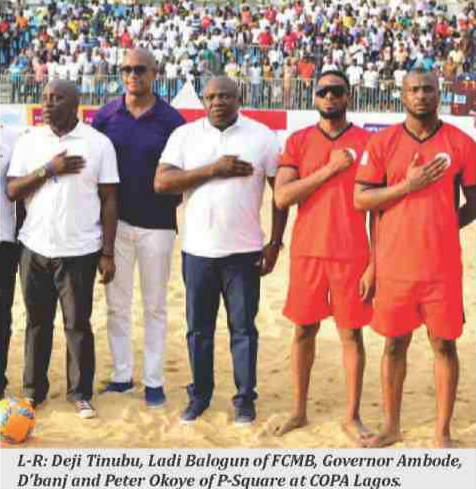 Governor of the State, Akinwunmi Ambode was at COPA Lagos last Sunday and he told journalists about his determination to make the event an unforgettable experience for the visiting teams, CAF officials and spectators. “Lagos is the next destination for sports in Africa,” he declared. Chairman of Lagos State Sports Commission, Deji Tinubu, is the man saddled with the responsibility of ensuring a successful hosting. Although the Nigeria Football Federation (NFF) are the host federation, the fact that their secretariat is in Abuja means that they also are guests of Lagos State, just like officials of the seven other participating countries. “We have made adequate arrangements for everybody.” Deji told me confidently last Sunday. For Lagos that is preparing to celebrate 50 years of its creation in a grand style next year, the 2016 Beach Soccer AFCON is yet another opportunity to demonstrate its readiness to welcome the world. I HAVE been invited to review the book, “The Basics of Sportscasting” written by veteran sports broadcaster, Deji Omotoyinbo. The launch and public presentation will take place on Saturday, 17 December, 2016 at the Sheraton Hotel, Ikeja, Lagos. If you are a true sports fan in Nigeria, you certainly will know about Deji Omotoyinbo of Sports Vision. He is unarguably one of the most gifted sports presenters in Nigeria. So, when he writes a book on the subject, we must pay attention to him. Next week, I will tell you how the book launch went and how you can grab a copy for yourself. Watch out.